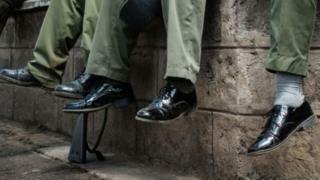 Kenya's ministry in charge of policing may have lost at least $1.7m (£1.3m) following irregularities in the purchase of officers' shoes, an official audit has found. The report described a "pathetic and unpleasant situation" with some officers wearing worn-out shoes and others buying their own footwear. It found that the cost of items had been inflated and receipts falsified. The audit also found that the bill for 4,420 motorcycles had been inflated. The ministry's records show there was a plan to buy 26,500 pairs of shoes but the payment vouchers show money was paid for 78,000 pairs. The report says that ministry officials defended the payments by saying that the extra shoes were for police trainees and another police unit. Auditor General Edward Ouko said the audit had discovered forged documents and that a physical inspection found some police officers had "opted to buy shoes from various vendors, contrary to dress regulations for police officers".